My family and I do not eat bacon solely for the reason that... pigs are to cute to eat! But, we still love the idea of the classic BLT sandwich. Although, this sandwich is far from the classic three ingredients of bacon, lettuce, and tomato, it is close and a yummy twist. Toast your two pieces of bread. Spread mayonnaise on one piece of your bread, salt and pepper. Microwave your favorite turkey bacon between paper towel on a plate until crisp. Lay your cooked bacon on your bread. 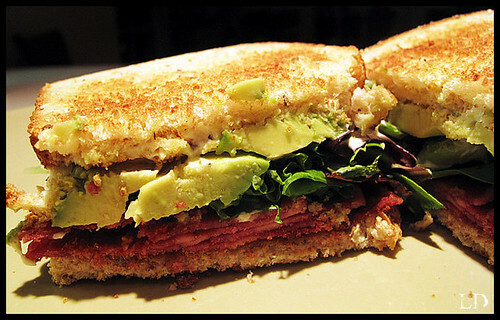 Lay your sliced avocado on top of your bacon and top with lettuce and your other piece of bread. This recipe make one sandwich. WOW!!! Mouthwatering! I haven't eaten lunch yet and this looks amazing! Oh YUMMO! Since I'm allergic to pork, this is perfect for me! TFS girlie! HUGS!